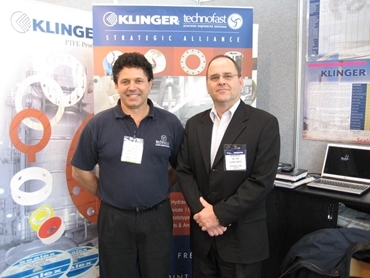 An alliance has been signed between bolt tensioning specialists Technofast Industries and fluid and gas sealing experts Klinger Limited to facilitate a complete jointing solution for heavy maintenance projects. Klinger Limited is a market leader in flange design and technology, while Technofast Industries is an award-winning manufacturer of bolt tensioning devices. The jointing procedure used by Klinger and Technofast involves hydraulic tensioning of multiple stud bolts in unison to ensure that even pressure is applied around the flange while the nuts are tightened, thereby eliminating leaks. Hydraulic tensioning stretches the stud bolt, utilising the elasticity of the metal. This eliminates the frictional forces associated with torque tightening, ensures the correct tension is applied, and improves the longevity of the stud. The closure technique has been successfully used in many heavy industry applications. Among projects that Technofast and Klinger have worked on together is a vessel closure at fertiliser manufacturing company Incitec Pivot that led to the customer buying a complete set of Technofast HydraJac hydraulic bolt tensioners to keep on site. Technofast designs and manufactures precision-engineered solutions in response to practical market needs. Technofast also maintains a stock of bolt tensioning equipment and on site machining tools for service or rental from bases in Perth and Brisbane. Technofast provides its products and services to a wide range of industries, including oil and gas processing, mining, steel making and chemical manufacture. Customers include major Australian corporations as well as transnationals such as Westinghouse Electric, Mitsubishi Heavy Industries and Bechtel. Technofast’s mechanical jointing solutions are saving customers many thousands of dollars during scheduled and emergency maintenance programs. Critical bolting times can be kept to a minimum, reducing downtime and increasing production, while accurate bolt loading eliminates the need for re-work. Technofast Industries has ISO 9001 approval, enhanced by additional approvals under the stringent 10CFR requirements of the US Nuclear Regulatory Commission.